The US Department of Health and Human Services projects that New Mexico will be short more than 2,000 licensed practical nurses by 2025. While 282 LPN licenses were granted in 2015, more qualified practical nurses will be needed to support the projected demand. Colleges in New Mexico are stepping up by offering quality nursing programs at all levels to prepare future generations of LPNs and RNs. In the following guide, aspiring practical nurses can get information on LPN programs in New Mexico, as well as details regarding state licensure requirements and salary and employment. Prospective practical nursing students can find LPN programs at large universities such as New Mexico State University and Western New Mexico University, as well as smaller institutions such as Clovis Community College and Luna Community College. To learn more about your options, use the search tool below to browse schools by acceptance rate, number of nursing programs offered, school type, student population, and tuition. You can also choose to see a side-by-side comparison of your top selections by clicking the compare schools button at the top. New Mexico is one of 25 states to honor compact licenses which allows nurses to work outside of their home state without having to go through the approval process. This gives nurses the opportunity to travel and work at the same time and makes the hiring process easier. Find out more about the New Mexico’s licensing process, what education is required and what to do when it’s time to renew a license. 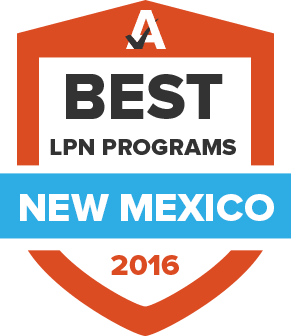 In order to obtain a license, LPN applicants must complete a program that has been approved by the New Mexico Board of Nursing. The Board of Nursing renews LPN licenses every two years, which costs $93. Applicants must complete 30 hours of continuing education by the time they’re ready to renew their license. Depending on where they work, LPNs in New Mexico can make good salaries. Although data from the U.S. Bureau of Labor Statistics indicates that the average salary for New Mexico LPNs is $46,360, specific wages depend on where in the state these professionals work. For more information about the earning potential of nurses in different metropolitan areas, continue reading. According to the 2015 New Mexico Board of Nursing Annual Report, 93% of LPNs are New Mexico residents. From Albuquerque to Farmington, this section breaks down what areas of the state have the most LPN opportunities. This page of the New Mexico Board of Nursing includes several reports on the nursing profession, dating back to 1996. Information in these reports includes data on LPNs working in different areas of the state, personal demographics of nurses, and the number of licenses issued. Outlines the continuing education requirements that LPNs must follow in order to keep their license current. Describes the procedure involved in obtaining a license by endorsement and how nurses from other states can meet licensing requirements in New Mexico. LPNs are expected to maintain specific standards in order to obtain and maintain a license in the state. This page outlines the laws that govern the field and what is expected in the practice of nursing. The Board is responsible for licensing nurses and regulating the standards of nursing education programs in New Mexico. Lists the LPN programs approved by the state. For over ten years, the New Mexico Center for Nursing Excellence has championed and supported the work of the state’s nurses. The organization provides awards for nurses, scholarships, and events. With local chapters in areas such as Las Cruces, Santa Fe, and Albuquerque, the New Mexico Nurses Association represents the needs of professionals across the state. The group’s mission is to promote the professional development of nurses, and to that end, it offers education, news, and advocacy. The New Mexico Department of Workforce Solutions provides data on professionals in the state, including nurses. Provides detailed statistics about nursing education in New Mexico from the New Mexico Nursing Education Consortium.